As I mentioned in a post a few months back, my wife Adrienne and I have been looking for a bike that would match up a little better with her around-town needs and with our Yepp mini kid-carrying seat. Well, I think we’ve found it… and it looks like the Electra Townie 7D. 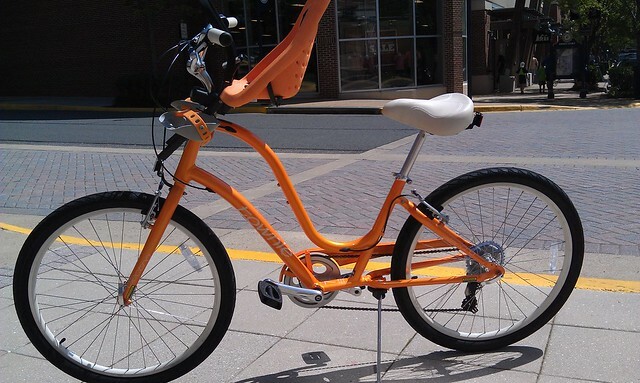 Two words come to mind with the Electra Townie: fun and relaxing! The laid-back position immediately makes everything seem less urgent, and it’s just a comfortable bike to sit on. That feel is a result of what’s called the “pedal forward” position – instead of being located at the junction of the downtube and seat tube, the bottom bracket (the thing your pedals and crankset attaches to) is located a few inches forward of that position. This relaxed position means a rider can put both feet down on the ground while still sitting on the seat – making it very stable at stops (and easy to stop suddenly). It also means that with the Yepp seat mounted, there’s very little issue with knee clearance on the seat (a big issue we had with the Trek hybrid Adrienne had before). Both feet on the ground! Electra makes a whole series of pedal forward bikes, from single-speed cruisers to multi-speed “Townie” bikes that can come with internal hub shifting or derailleur shifting. While the idea of an internally geared hub was attractive, the derailleur 7-speed version fit our budget better. The Townie series of bikes comes in two versions: “men’s” and “women’s.” Really, there are only two differences between these: the overall size (men’s is a little bigger) and the shape of the frame: on the women’s bike the frame has very easy stepover, while the men’s has a more classic design. I actually like the women’s version just fine – size-wise I think you have to be pretty tall before it feels too small, as the angle of the seat tube means that as the seat goes up, your position on the bike goes back, so it adjusts to fit pretty nicely. I also like the step-through frame for riding with the Yepp on the bike – it’s a lot easier to get on and off. Without the front-mounted seat it probably wouldn’t matter – but with it, it’s an attractive feature. Disadvantages? Well, we’ve only found a couple so far. One is that it’s hard to make this bike move quickly – the pedaling position really doesn’t lend itself to cranking hard, and standing up to pedal is a little more awkward than on most bikes. This also means that when towing a bike trailer (which we’ll do on occasion with this bike), the overall pace is slower and the trailer feels heavier. The other big disadvantage is that it won’t fit on a regular bike rack without some sort of adapter (which we haven’t yet tried) – to get it home we had to put it on our bike rack upside down and at a pretty ridiculous angle! For what we need to do these are livable negatives, but I wouldn’t get this bike with the intention of riding long distances at all quickly or if we weren’t riding directly it from our home. Other advantages? The balloon-style 26″ tires absorb bumps pretty well, and the seat – although it looks huge for a normal bike – fits this style of bike and is comfortable. The only thing we’ve swapped out from the original configuration is a set of ergonomic grips, which made a big difference (the original grips had fancy stitching on them which was uncomfortable). And again – the bike is just plain fun! 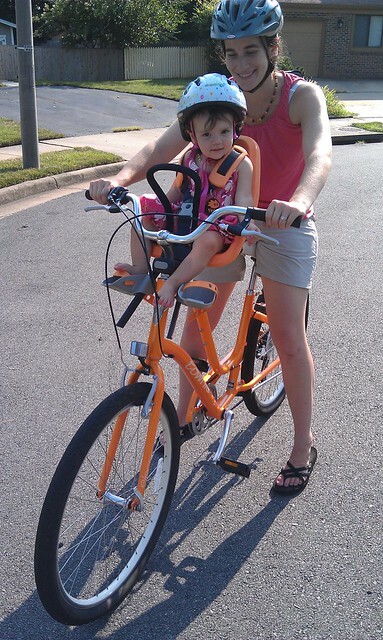 In one of my previous articles, I discussed ways to carry kids around on a bike and get them involved in biking as transportation early on. 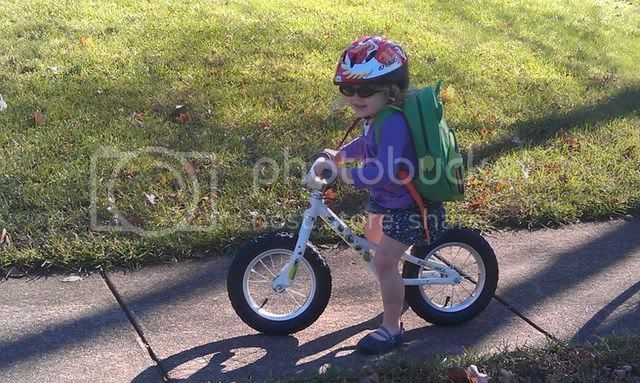 However, with the first phrase out of anyone’s mouth after an adult confesses to riding a bike being, “do you wear a helmet?” you can bet your panniers that helmets for kids – and especially little ones – are a must: if not for safety, for the impression of safety. The problem: hardly anyone in the U.S. really believes that kids under the age of 2 or so are going to be on a bike! Hence… the great infant helmet search of 2012. The first thing you have to figure out when looking for a helmet – for anyone – is head circumference (generally in centimeters, though a few manufacturers will throw you off and do it in inches). For R – our 9-month-old – that magic number is 45 cm. 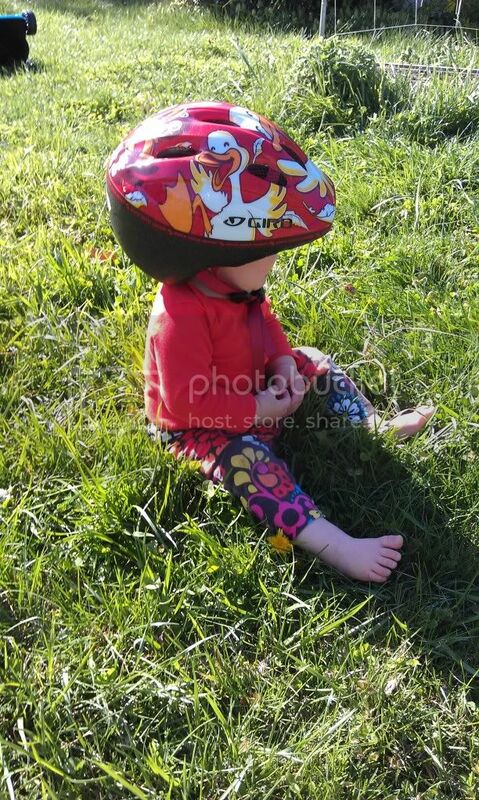 That makes things quite tricky – most “toddler” helmets don’t go that small – and those that do, look ridiculous on her! 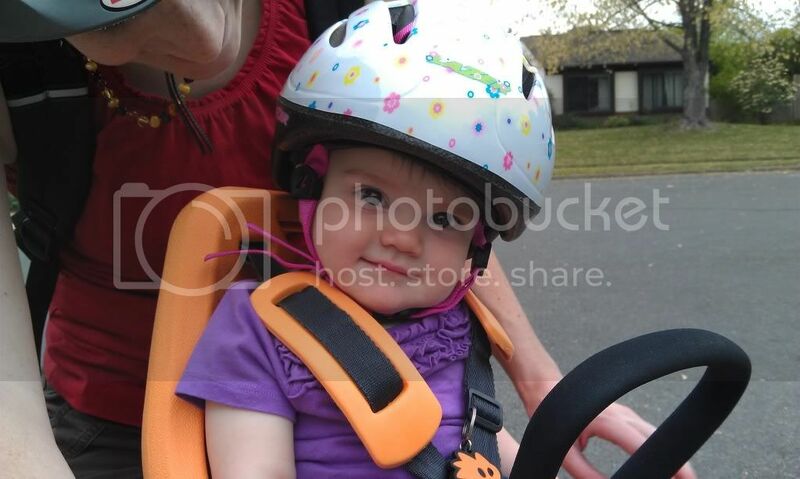 Additionally, a lot of helmets are designed for on-bike use and stick way out in the back – making it very hard to get an infant or toddler into a trailer or high-backed seat in anything resembling a comfortable position. Lazer infant helmet – Only goes down to 46 cm, but Totcycle reports it’s a smaller helmet, so it leaves infants with less of an “I have a football helmet on my head” feel. Nutcase Little Nutty (XS) – More expensive than pretty much everything else at $55, but looks like it might not dwarf an infant head so much. The first Amazon review says it’s too small for a 2-year-old (which many others aren’t), so that may be a good indicator. Giro Me2 – Only goes down to 48cm, looks huge on an infant. However, it’s a nice helmet and we’ve used it with our older daughter. Spin dial on back makes size adjustment a breeze. Bell Sprout – Only goes down to 47cm, but says it’s optimized for trailers and seats – which may be better than many others. Specialized Small Fry toddler – Fits 44-52cm according to the label, but it doesn’t fit my daughter’s 45cm head very well. Also, it’s approximately the size of her torso. A nice helmet overall though. A lot of these are available in different styles – I’ve just linked to girly ones because we have girls (and when all you can see is helmet, it’s nice not to have your child’s gender misidentified). Anyone else have a recommendation? Any experiences with any of the above? We know everyone here at bikecommuters.com uses their bike to get back and forth to work at least some of the time. But what about other destinations? And what happens when you have to bring the family along? Since my wife (who’s a stay-at-home mom) and I share one car between us, we’re familiar with a couple strategies and are considering a couple more. Here are a few things we’re using/have used/will use with our two daughters. Our older daughter, J, is three years old. Since she was about a year old, we’ve used a BurleyD’lite trailer (my review here) to pull her around. We’ve used it on trips to the playground, trips to the grocery store, and for getting around while on vacation. It’s a handy thing: it holds up to two kids plus a bunch of gear (we’ve had a week’s worth of groceries in it before!). However, it is a little bulky and can be annoying to hook up (and unhook) when you’re only going a short distance. 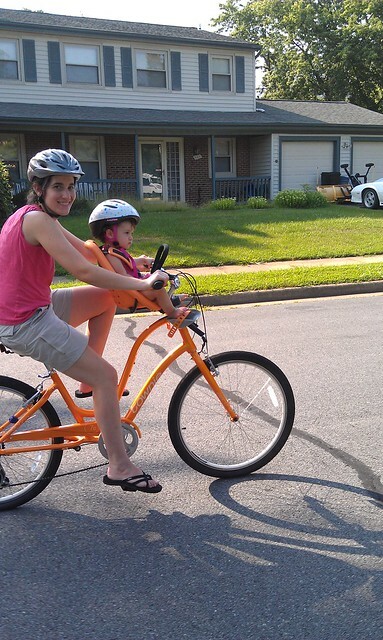 Once kids are a little older, they can often bike along on short errands. We started J on a balance bike when she turned three (though other parents have started as early as 1!). She’s able to go around 2-3 miles round trip on this without too much fuss, which gets us to destinations like the library or the farmers market. 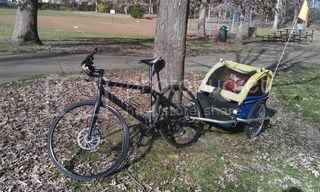 Another good option for tired kids or longer rides is some sort of trailer bike. For younger kids, it gets tricky. Most physicians don’t recommend putting infants in most bike seats, as their necks aren’t strong enough until they’re around 9 months to a year old. However, that doesn’t mean you can’t put them on a bike at all. The family over at Totcycle has compiled a good list of options, including using a car seat base in a trailer, or putting a car seat in the front box of a bakfiets or rear “bucket” of a Madsen. The bakfiets or Madsen bikes generally require a large up-front investment, but offer the advantage of a bike you can continue to carry kids in for several years. 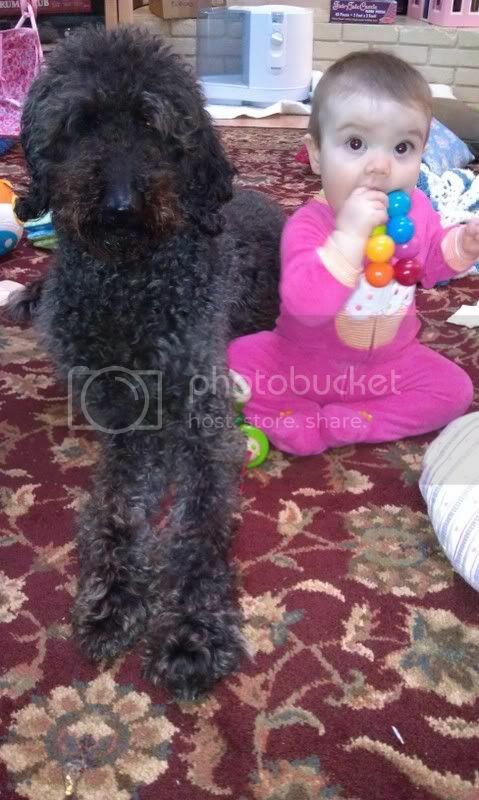 We haven’t put our younger daughter, R (8 months, pictured here with her constant canine companion Otis), on a bike yet – a combination of laziness, cold weather, and not being too enthusiastic about our car seat working well with our trailer. However, we’re looking at a couple options right now. 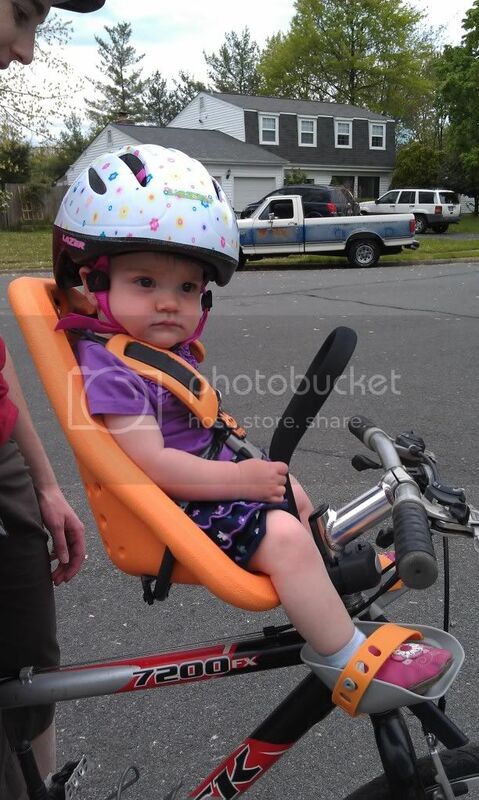 The Topeak Babyseat is a classic rear-mounted “kid’s bike seat” – on steroids. It’s got some nice safety and comfort features (suspension! ), and has the advantage of being quickly removable (the rack then works seamlessly with Topeak’s other lock-on bags). We’re also looking at some front-mounted seats, such as the Yepp mini or the iBert. The advantage with these is that the child is in between your arms, can see really well, and can easily converse with you (assuming they’re able to converse with you to begin with). The disadvantage is these apparently turn many children into speed freaks, constantly urging you to go faster and making you work even harder! There are tons of options out there – more than most people realize – and once kids get started biking, most of them continue to enjoy it (and will hopefully grow up thinking biking for errands or to work is normal and fun!). In my view, bringing up the next generation to bike everywhere is even more important than biking everywhere ourselves – and (most of the time) is a lot of fun too! BIKE TRAIN…. What is it and what is it good for??? A few months ago I was reading an issue of Bicycle Paper, a Pacific NW regional cycling publication covering all aspects of cycling in Washington & Oregon. I found an article about a gentleman by the name of Kiel Johnson. Kiel is a local advocate of cycling. When I say advocate, I MEAN ADVOCATE! He is involved! Imagine… instead of big, yellow, diesel smoke spewing school buses there were ‘trains’ of bicycle riders following a set route to school. Picking up riders along the way, growing in numbers along the way to school! This is what Kiel has started here in Portland. BC: Kiel, tell our readers about Bike Trains, What are they and what is this about? KJ: Bike trains are about creating communities of people who bike to school. They are a group of parents and students that bike together to school on a prearranged route. The bike trains in Portland run one morning every week. We need to understand these tragedies and make sure that we are contributing to a system that prevents them from happening to anyone else. Bike trains are part of finding a solution to this problem. They create a visible, fun, and comfortable alternative. They also draw in a lot of people who are more cautious about biking to school and wouldn’t do it on their own. It is about making biking to school an event, something that people can talk about and feel a part of. BC: How many trains exist in Portland today? KJ: There are seven schools in Portland that have a bike train. A few of them have stopped running during the winter but there is still a lot of participation. I had one parent tell me that last year, before there was a bike train, she would be the only one locking up in the winter. Now there are about ten bikes parked everyday in all weather conditions. Many schools have several trains that come in from different directions. For instance Beach, which started last year now has four routes. There is also a bike train that started in Vermont. BC: How many kids are participating? KJ: So far there have been 1184 student and parent riders on a bike train this year. That is just counting the official bike train day at each school. BC: How many adult volunteers does it take to make a successful Bike Train? KJ: All it takes is one very enthusiastic parent willing to go for it. BC: How is this type of program funded? KJ: We just got a $5,000 grant from the Oregon Department of Transportation. The goal with the grant is to disperse it to the different schools. Let each bike train leader spend it in ways that will improve their school. BC: How would others go about securing funding for a Bike Train in their communities? KJ: I wouldn’t worry about funding. I’d just go out and start it. BC: Do you think business sponsorship might work for a program like this? KJ: There is a lot of potential for local businesses to sponsor a bike train. There was a bike train in Portland a couple years ago that was sponsored by REI. On a couple occasions the bike train stopped by the REI and staff handed out energy bars and let the riders climb on the climbing rock. REI wins because they look like they are participating in the community and are helping establish future customers. The bike train wins because it makes the riders feel like they are a part of something. BC: What are your expectations for 2011, in regards to the Bike Train program here in Portland? 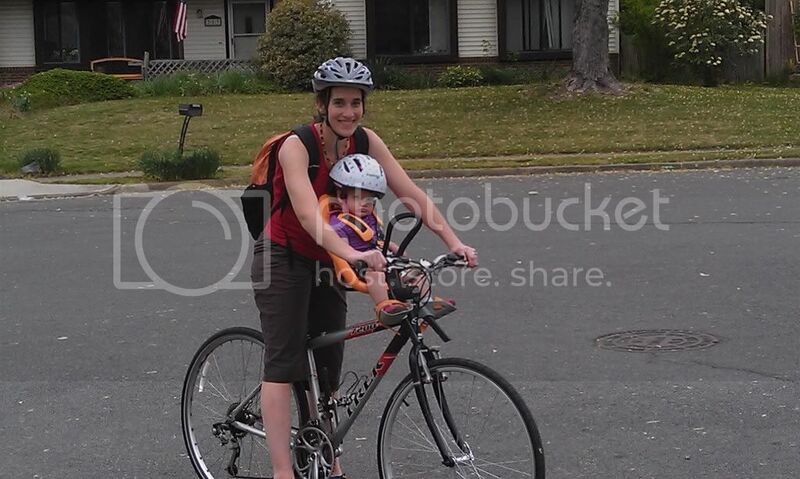 KJ: I think April is going to see an explosion of families biking together to school. Everyone feels like we are at a tipping point. Biking to school is becoming “the thing to do”. It is exciting to be a part of this movement. Kiel has put in tons of work to make biking to school a viable form of transportation for many kids here in Portland. I have done it for my own kids since moving here, now it’s time to move onto a much bigger stage. I have been talking with the PTA president at my kids’ school and Kiel. We are planning on starting our own Bike Train here in NE Portland. I will keep you posted!